What a busy couple of weeks I have had. I enjoyed teaching a lovely group of ladies from the Friday Howick Quilting Friends Drunkards Path techniques using the Phillips Fiber Arts Cut A Round tool. Because this one day class is a technique class I have no quilts to show you in this post but I am hopeful someone will send me some pictures which I will pass on. But here the girls are being busy. 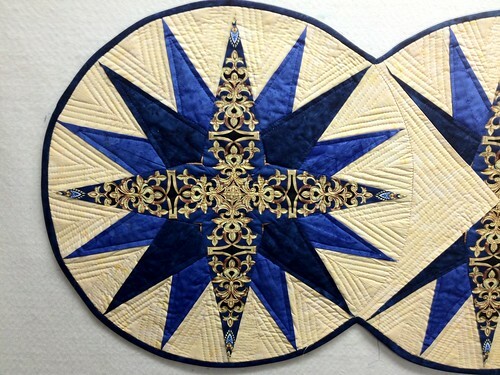 1.30pm The Fastest Easiest Double Wedding Ring Quilt Ever. I have featured this in my previous blog. “But Wait There’s More” You have heard that expression. I can’t give away too much information now but here are a couple of sneak peeks. Check out my next blog and I will post all the pictures from the show so you ladies who cannot be there will get to see what the mystery is all about. As a “seasoned” show attendee from both sides of the counter I thought a few tips would not go amiss. 1. Nobody looks below your knees, so comfort is the order of the day. Wear shoes that will carry you around from start to finish. 2. Carry a bottle of water with you. If possible bring one from home. The caterers at the venues charge like wounded bulls for bottled water. But do treat to yourself to a nice lunch. You deserve it after all that exercise you put in walking the halls. 3. Take those bags that fold up really small in your handbag, you always buy more than you thought you would. And it saves needing octopus arms to carry all those individual parcels. 4. Look before you buy. I have been told by customers so many times at shows that they bought …. a few aisles before. Then when they listen to another merchant during their visit, have found that the impulse buy at the start was sometimes unnecessary. Also sometimes prices vary. 5. Take time to enjoy the exhibits. I am guilty of not doing this. We are fortunate to have a wealth of talent and here it is all under one roof. So plan your day. If you can stay longer in the afternoon then do .For some reason the aisles are much clearer after 2.30pm. 6. Attend the workshops, they are usually free and you can always pick up a new tip or technique. 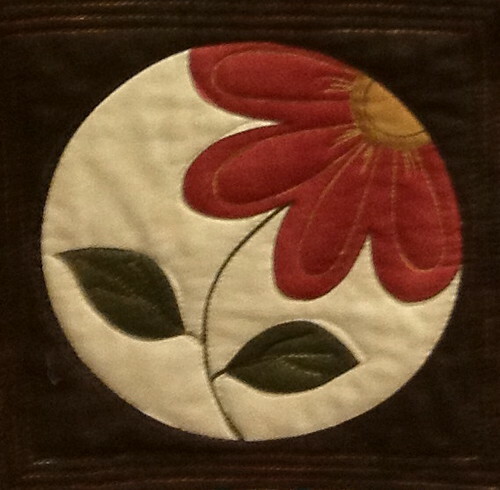 I like to talk about and show the newest of my quilts and tools. 7. Use it or lose it. The show held in Auckland in February this year and last year, will not be on again. This sounds harsh but in this economic climate if we do not support these events they will not be there in the future. This also applies in the Quilting industry we will lose those wonderful suppliers in our area if we do not support them financially. 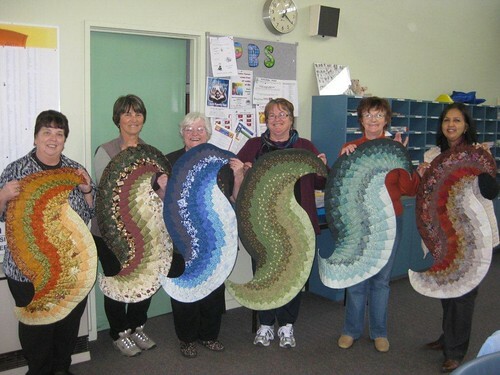 In Australia I have been told in the last 12 month over a hundred quilt shops have closed down. Not easy to find a person working in a quilt shop when you are in need of help, to complete that project the one that you bought the fabric from the US, if the quilt shops are not here, is it? I love being at the show it’s a great way for me to meet up with fellow quilters, customers and friends that I have not seen for a year. 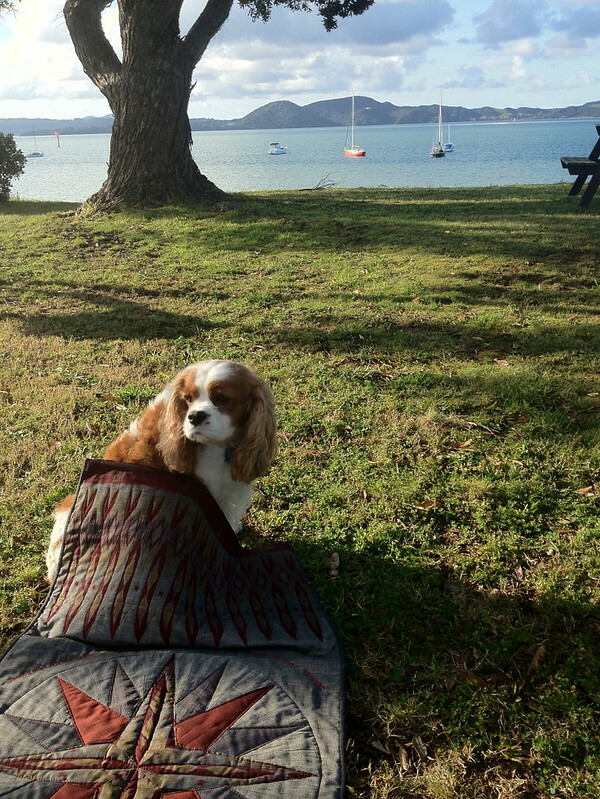 As a specialist web based business, it is the way my customers get to meet me and touch and feel fabric. 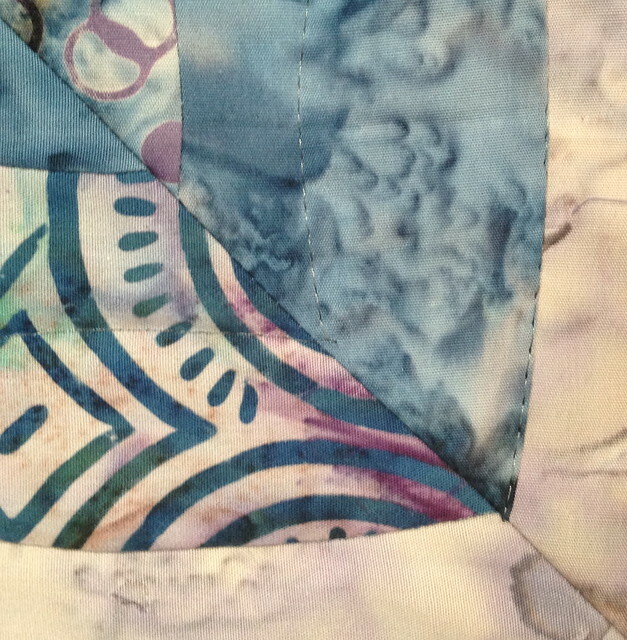 So much happens in our quilting world, there is always something new to learn and see. There is something special about spending time with like-minded people. Yes the show is a commercial venture but I think it’s more than that. We are very fortunate in the North Island to have the opportunity to attend two shows. 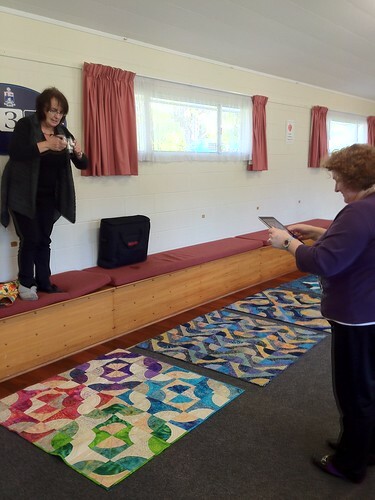 Craft and Quilt Hamilton and Calico Christmas now called Auckland Festival of Quilts. This year I will be attending as a merchant once again and am really looking forward to it. More on that closer to the time. Because this is my “home” show i.e. in NZ not Australia and I do not need to freight over the ditch, I do like to have a little special or two or three. To the girls who are not at the show I will extend this offer to you for 1 month until 6th October 2012. Thought I would show you a little of what I have worked on this last week. 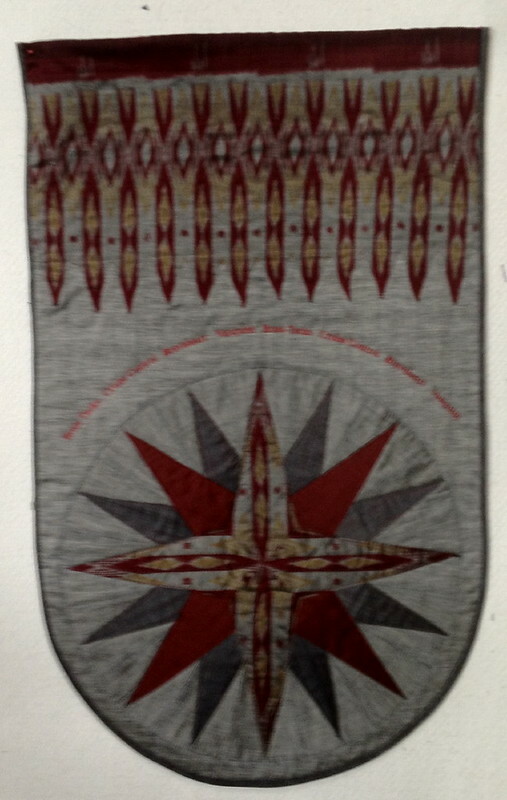 We have a friend with a special birthday he enjoys being on ,boats so what else but a Mariners Compass wall hanging. My helper Carlos wanted to be in the photo. Check out the boats behind. Only two weeks to go until the Craft show, so better get my skates on, make a couple more quilts and cut more fabric. 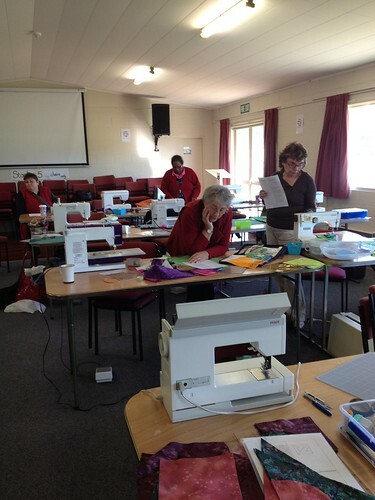 PS Lesley from Australia sent me this picture from a Quilting retreat in Mansfield. Cute eh check out the Spicy Spiral Pattern they used.